Rip DVD video to audio and enjoy the original audios of your DVD movies. DVD Audio Ripper for Mac is a program designed just for Mac OS X (include Mac OS X 10.5 Leopard, Mac Intel and Mac PowerPC) users. 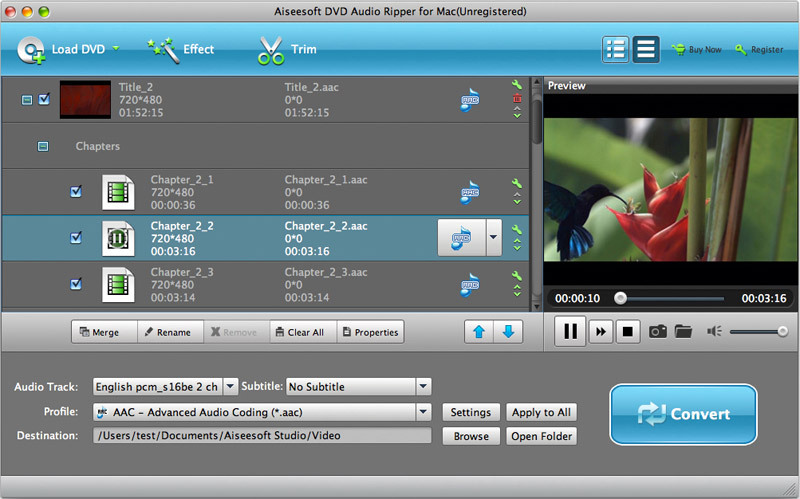 DVD Audio Ripper for Mac provides a series of powerful settings. It lets you choose the audio of any chapters or titles to convert, select DVD audio track, trim the audio of your DVD title or chapter, and even merge the audio from selected titles or chapters into one file. Extract your favorite DVD audio tracks for your audio players with DVD Audio Ripper for Mac! A professional dvd movie soundtrack ripper developed just for Mac OS X users. A powerful DVD Video to Audio Ripper that rips DVD audio to MP3, M4A, WAV, AAC, AC3, etc. This mac audio ripper lets you set audio output settings including sample rate, channel, encoder and bit rate. Select any available audio track on DVD. Trim the length of any title or chapter to convert your favorite audio clips. Convert the audio of selected titles or chapters into one file. By a few simple clicks, you can easily rip DVD video to audio and enjoy your favorite audio tracks on your audio players with this dvd audio extractor! Why Choose DVD Audio Ripper for Mac?